Genesis Earthworm Jim 2 (USA) in 21:15.06 by YamiAmarillo. We follow our hero, Earthworm Jim, as he attempts to foil the evil Psycrows' plan to steal away the beautiful Princess What's-Her-Name. 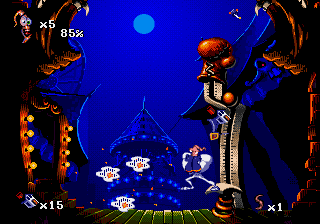 YamiAmarillo beats this quirky game in record time, via the use of various tricks and glitches, as well as using the easiest difficulty to minimize the in-between level mini-games.